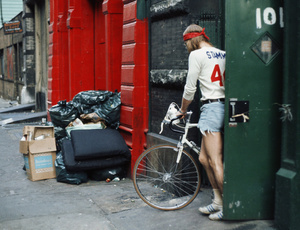 Ted Stamm (1944 – 1984) was one of the most multi-faceted conceptual and dedicated artists working in SoHo in downtown Manhattan in the 1970’s. In his studio, Stamm developed and researched focused series of paintings, works on papers and studies titled Woosters, Dodgers, Zephyr, Concorde, Chance, Cancel, among others. Stamm’s practice extended beyond his studio, to areas including mail art, artists books, photography, site-specific installations and pre-graffiti street works documentation that Stamm titled Designators. Many of Stamm’s inspirations derive from observing everyday objects, experiences and events, such as finding an abstract shape on the street or lines on a baseball field. Stamm’s works are fully abstract, and it is unnecessary for the viewer to know the origins of what he or she is looking at in order to experience them the way the artist intended. Black is a consistent component of Stamm’s work, as it was a color associated with rebellion, rigor and reduction. Stamm created a rich oeuvre in his short lifetime which became influential for artists coming of age in New York over the past thirty years. Ted Stamm exhibited internationally during his lifetime, including in Belgium, Denmark, Germany, Italy, Sweden, Switzerland and the United States. His work has been included in solo and group exhibitions at venues such as Solomon R. Guggenheim Museum, New York, NY, USA; Brooklyn Museum, NY, USA; MoMA PS1 Contemporary Art Center, Long Island City, NY, USA; The Clocktower, New York, NY, USA; Museum of Contemporary Art, Los Angeles, CA, USA; Albright-Knox Art Gallery, Buffalo, NY, USA; Aldrich Contemporary Art Museum, Ridgefield, CT, USA; Rose Art Museum, Brandeis University, Waltham, MA, USA; Contemporary Arts Center, Cincinnati, OH, USA; Museum of Art Fort Lauderdale, FL, USA; Oklahoma City Museum of Art, OK, USA; Santa Barbara Museum of Art , CA, USA; Grand Rapids Art Museum, MI, USA; Montgomery Museum of Fine Arts, AL, USA; Denver Art Museum, CO, USA; Nelson-Atkins Museum of Art, Kansas City, MO, USA; Akademie Der Kunste, Berlin, Germany; and Louisiana Museum, Humlebaek, Denmark. In 1977, Stamm was included by curator Manfred Schneckenburger in Documenta 6 in Kassel, Germany. His work was exhibited alongside artists, such as Carl Andre, Daniel Buren, James Lee Byars, Walter De Maria, Eva Hesse, Donald Judd, Imi Knoebel, Sol Lewitt, Gordon Matta-Clark, Robert Morris, Blinky Palermo, Robert Ryman, Fred Sandback and Richard Serra, among others. In addition, Stamm exhibited his work at the legendary Downtown artist-founded venues 112 Greene Street (1975), Artists Space (1975, 1980) and Franklin Furnace (1977, 1980). Stamm received awards in Painting from the John Simon Guggenheim Memorial Foundation (1983) and the National Endowments for the Arts, NEA (1981–1982). Stamm’s work is included in the collections of Brooklyn Museum, NY, USA; Carnegie Museum, Pittsburgh, PA, USA; Fondation Louis Vuitton, Paris, France; Hall Art Collection, Derneburg, Germany and Reading, Vermont; Museum of Contemporary Art, Los Angeles, CA, USA; Phoenix Art Museum, AZ, USA; Aldrich Contemporary Art Museum, Ridgefield, CT, USA; Museum of Modern Art, New York, NY, USA; Solomon R. Guggenheim Museum, New York, NY, USA; and Western Australia Art Gallery, Perth, Australia.